Currently underway for City of Vancouver and in collaboration with C.Y. 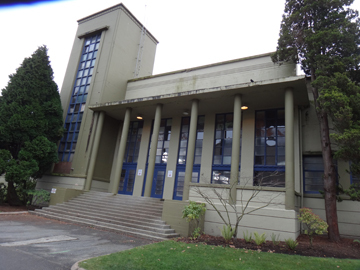 Loh Associates, structural engineers, CAGP is providing architectural services for the building envelope retrofit of the heritage-listed Livestock Building at Hastings Park. Constructed in multiple phases commencing in 1929 with a major addition in 1939, this 140,000 sf. heavy timber/concrete structure is most actively used for livestock displays and competitions during the annual Pacific National Exhibition (PNE). Phase 1 of the work includes total replacement of the badly deteriorated roof and related clerestory windows; phase 2 will include seismic retrofit of existing structure; phase 3 will complete the project with retrofit/ refurbishment of all exterior wall elements. The City’s intention is to expand the use of this heritage building and integrate it with proposed public space improvements as part of a revitalized Hastings Park Plan. 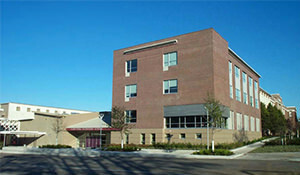 The COLBORNE ARCHITECTURAL GROUP designed a major addition to this existing secondary school to increase the school capacity by 350 students. The firm has also designed a major seismic upgrade to the existing classroom block, which was executed in phases while the school remained occupied. The addition was designed to consider the existing heritage central classroom block as well as to integrate the circulation and functions of the two separate blocks within the school. Work was planned so that the addition would be constructed first, acting as the wing space to allow partial vacating of the existing building to facilitate phase 2 of the seismic upgrade.